Many new flooring products have greatly impacted our homes in recent years. A broad selection of economical flooring products have been developed that are easier to install and maintain than some of the traditional flooring materials and finishes. The floor covering market has, therefore, become quite competitive and flooring dealers often discount their wares substantially. Yahoo. Wednesday, 10 Apr 2019 09:06:00 -0400. Is the flooring in your building entrance safe? ISHN. Monday, 11 Mar 2019 00:00:00 -0400. The primary flooring materials are wood, stone, vinyl, ceramic, rubber and linoleum as well as wall-to-wall carpeting in wool, nylon, and other synthetic fibers. Wood floors constructed of oak, maple, or other hardwoods are available in solid wood or laminated wood variations. Hardwood floors can be finished to highlight the beauty of the wood grain and are generally long wearing, especially if they are made of solid wood. Stone floors are beautiful and hard-wearing and are often made of limestone, slate, marble, or flagstone. They are cool to walk on in summer but can be cold in winter unless radiant heating is installed under the floor. Ceramic tile floors are versatile and easy to clean; they are available in an extensive range of shapes, finishes, textures and colors. Similar flooring includes quarry tiles and terrazzo. Good quality vinyl flooring is produced in tile and sheet form and is available in many designs and colors. Vinyl is hard-wearing and requires little maintenance but care must be used when joining large vinyl sheets. Rubber floors, available in tile and sheet form, are expensive and mark easily, but they can provide an attractive, smooth, solid-color finish, especially when installed professionally. Linoleum floors are made from wood, flour, linseed oil, resins and pigments — natural materials that impart a muted character even to bright colors. Linoleum requires professional installation for a good quality finish. Wall-to-wall carpeting is a popular floor covering because it offers warmth, comfort, and a quiet sense of elegance. Available in many textures and colors, it should be installed over quality underlayment to help it absorb sound and wear better. Laminate floors are relatively new in the United States, but they have been used in Europe for decades. Laminate flooring consists of multiple layers, including an image layer that mimics the appearance of traditional flooring materials. Flooring-Types.com features convenient access to selected flooring dealers and flooring manufacturers, where you can find and compare specifications on a wide range of flooring products. Homeowners will appreciate the simple floor care and carpet care tips that can help your floor last longer and keep it looking fresh and clean. This Virginia-based firm has one of the largest inventories of pre-finished and unfinished hardwood floors in the industry. 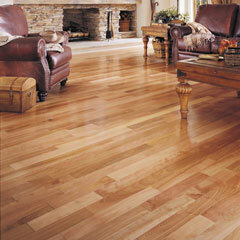 They offer a variety of flooring brands for residential and commercial construction. Because they negotiate directly with lumber mills, they can pass savings along to their customers. Find a good selection of laminate flooring, hardwood floors, area rugs, and floor tiles at this discount flooring supplier. This flooring manufacturer features "floors for the way you live." Leading manufacturer of resilient flooring products. This vendor's flooring brands including Armstrong, Bruce, Hartco, and Robbins. This well-known, hardwood floor manufacturer features affordable, stylish, elegant products for the home. Discover the latest in flooring design for your home. This floor products supplier directory lists flooring installers throughout the USA. This floor products supplier directory lists flooring manufacturers throughout the USA. This floor products supplier directory lists flooring retailers throughout the USA.